Automated solar shading systems are practical applications used by European architects and building owners for decades to substantially reduce building energy usage and increase natural daylight. Worldwide, many of the most sustainable and greenest buildings (i.e. high-performance and net-zero structures) use automated solar shading. Green Roofs for Healthy Cities’ (GRHC’s) new survey suggests a 10 per cent growth in vegetated roofing assemblies across North America. Data is collected from GRHC’s members on the size, location, and type of green roofs that have been installed within the year. harness the attributes of exterior insulation and finish systems (EIFS) to help ensure energy-efficient buildings. 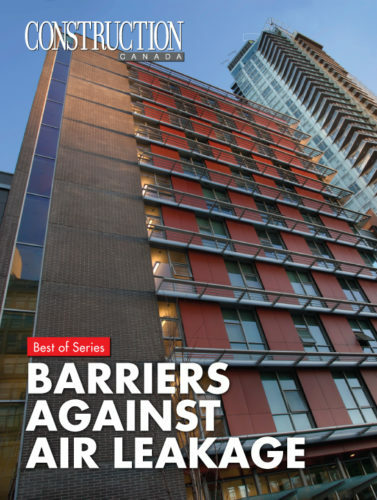 Download the “Barriers Against Air Leakage” e-book in two different formats—pdf or digital edition—by visiting https://www.constructioncanada.net/ebook/barriers-against-air-leakage-e-book.